This skirt has been in my closet for the longest time. You may remember seeing it here, here and here. It has such a fun print on it that I may not ever be able to give this up (maybe when the threads starts to go?). It's so much fun remixing the skirt with newer pieces...like my super fun Loeffler Randall biker bag. Now all I need is a cute bike. Very pretty pattern on the skirt! I love when I find a good piece that last me a long time. Love it. This stripes and pattern combo is the best. Love it! I absolutely love this skirt. The colors and the print are so pretty! I love all the details to this outfit! The satchel is so crisp and structured and I really adore the color. 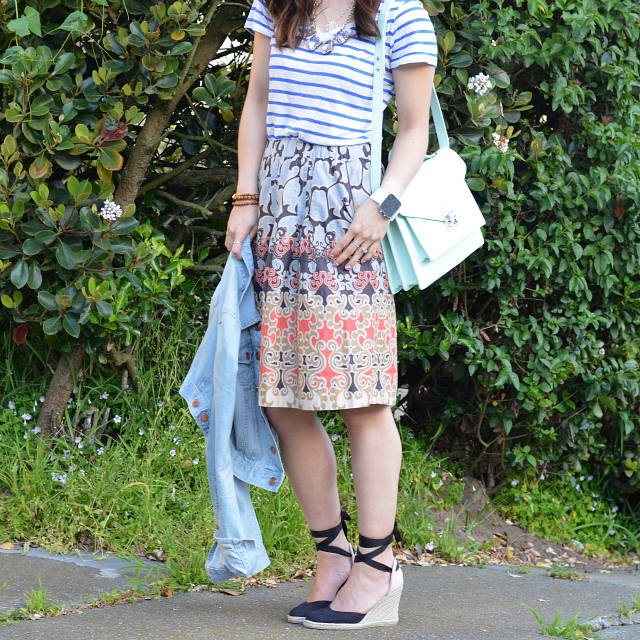 Your skirt is beautiful as well, a really gorgeous spring look! 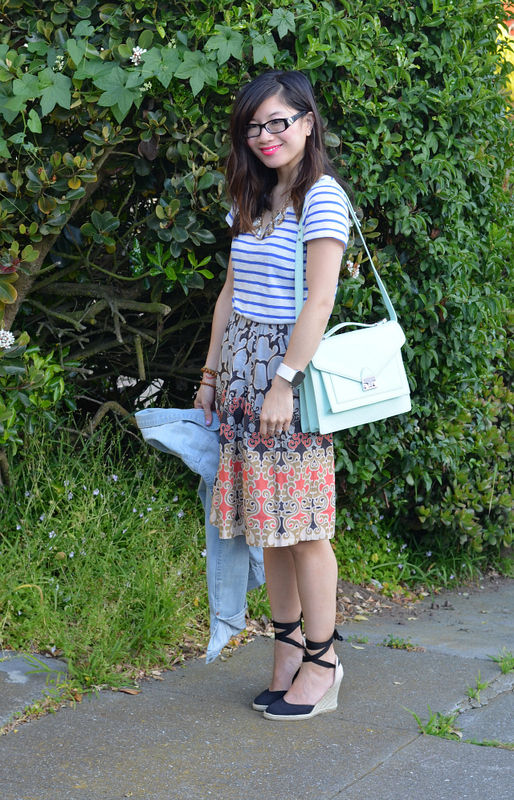 The stripes complement that skirt so well... love the pastels! And what a cute bag, perfect color for spring. p.s. your nails are maj! Oh good lord, that bag is adorable! And you could not have picked a better color; I love mint! It's a really cute skirt! Wear it til you can't wear it anymore. HaHa I have a couple of items in my closet like that. You look great with glasses Nancy! I'm swooning over your LR bag - love the color. I can't believe you thrifted those fab wedges - so cute! 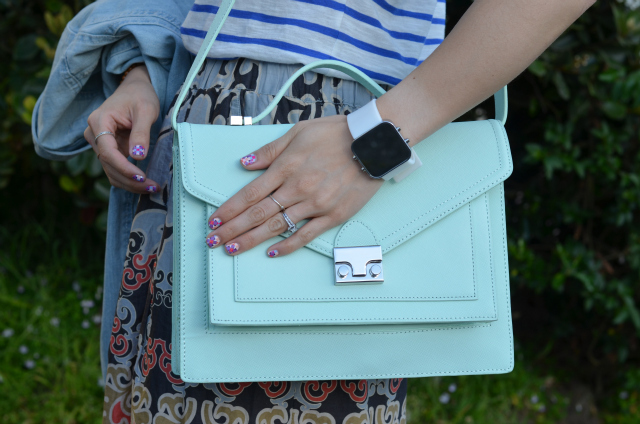 I love the pattern mixing and that perfectly minty bag! So amazing! The hand bag is divine!! Cute outfit! The skirt is especially adorable. I wish I could wear the same type of clothes here, but it's still a bit chilly for sandals! I love the pattern and colors of the skirt. Plus I'm obsessed with your bag! You look great. EEEE!!! I have been DYING for one of these bags. I love yours - that color is perfect for you.And it goes so well with this skirt indeed. I adore your skirt! It is the perfect length! 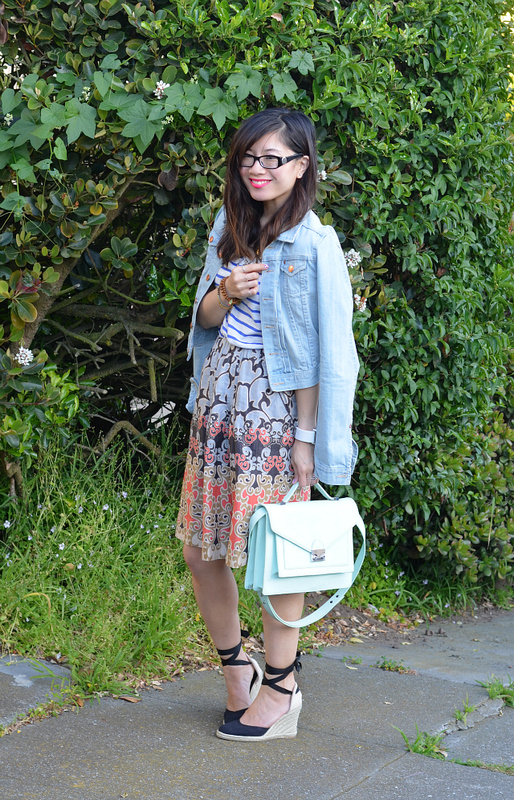 Definitely loving this pattern mixing and that mint bag is supurb! Love that skirt! The pattern and colors are great! 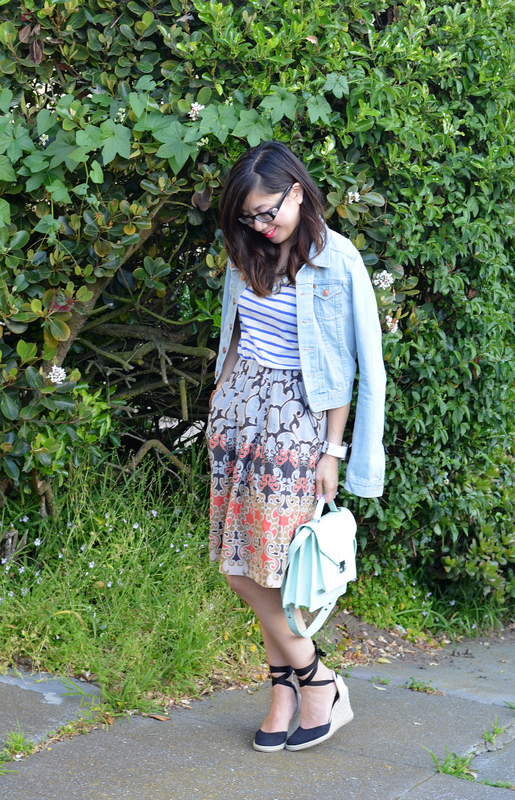 Ahh I've been crushing on that LR bag - I love the mint color and you're mix of prints here! 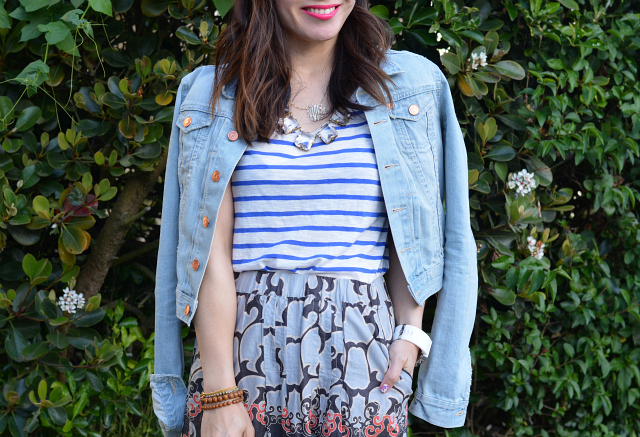 I can see why you love this skirt - the colors and pattern is so versatile. Loving the spring look! That's a very pretty outfit!! Love the skirt and the bag. Just gorgeous!